Kyoko Mogami is a 16-year-old girl who loves her childhood friend, Shotaro “Sho” Fuwa. She follows him to Tokyo and works hard to support him while he pursues his dream of being a top pop idol. Sho betrays Kyoko, however, so she decides to get revenge by becoming a bigger star than Sho, who is ranked seventh among the top 20 most popular male celebrities in Japan. As Skip Beat!, Vol. 36 (Chapters 213 to 218) opens, Kyoko's time in Guam is coming to an end, as she finishes shooting her role as “Setsu.” She won't have a reason to be around Ren Tsuruga, but it seems that he will miss her also, as he leaves her with a memento to last until they meet again. Once she is back in Japan, Kyoko finds that her past has come back to haunt her on two fronts. One is upfront, but the other seems to be uncomfortably on the periphery, but is getting closer. Then, Kyoko comes to the aid of actress Chiorin Amemiya. THE LOWDOWN: About a year ago, my VIZ Media press rep sent me a copy of the Skip Beat! manga. Vol. 34 was the first graphic novel that I had read of this series that I had long assumed was some kind of sports or music manga. After some initial feelings of disappointment, I found myself enjoying Vol. 34. The first three chapters of Skip Beat! Volume 36 did not really interest me. Once the story moved back to Japan, I found myself quite engaged with the bubbling plot lines. What little of this series that I have read suggests to me that creator Yoshiki Nakamura is at her best with conflict, strife, and melodrama. That is the stuff that makes for page-turning reading. Honestly, Kyoko's romance with Ren interests me only a little, but the ending of this installment makes me look forward to the next volume. 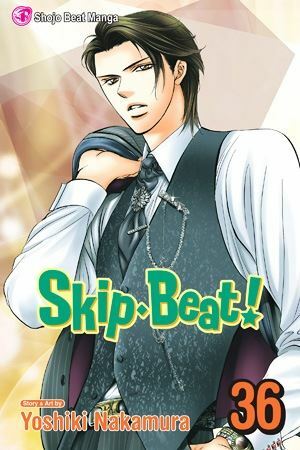 POSSIBLE AUDIENCE: Fans of shojo romance will want to try the Shojo Beat title, Skip Beat!